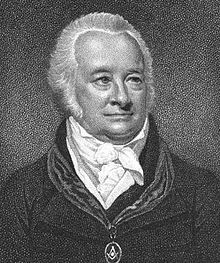 Today in Masonic History William Preston is born in 1742. William Preston was a Scottish Masonic Scholar. Preston was born on August 7th, 1742 in Edinburgh, Scotland. He attended the Royal High School, Edinburgh at the age of six. He studied the classics and excelled in Latin. It is presumed he also learned Greek. He went on to college, although it is not clear where. His father passed away when Preston was nine and Thomas Ruddiman, a Scottish Scholar, was made his guardian. He would become an apprentice to Thomas's brother, Walter Ruddiman, a printer. Up until Thomas's passing Preston spent most of his time reading to Thomas, transcribing Thomas's work and copy-editing. In 1760, Preston traveled to London with letters of introduction from Walter. Shortly after Preston's arrival in London, a group of Scottish Masons who were living in London decided to form a lodge. The Grand Lodge of Scotland did not want to grant a charter concerned they would infringe on the authority of the Antient's Grand Lodge in London, the only of the two, Antient and Modern, Grand Lodges recognized in London. They became Lodge No. 111 and Preston was one of their first initiates. Preston and other members of his lodge were not happy with the "new" Grand Lodge they had become associated with, so they decided to join the Grand Lodge of England (Moderns). Under their new charter they became Caledonian Lodge no 325. Caledonian Lodge would become a major component of the first Grand Chapter of Royal Arch Masonry. In 1769, Preston published his most famous Masonic work, Illustrations of Masonry. Preston used his research into the history of Freemasonry and began forming his work into lectures. He began in 1772 getting together every two weeks with members of his lodge to help him refine his presentations. After he began delivering them as lectures, there were twelve per degree, two of the attendees were members of the Lodge of Antiquity, formerly the Goose and Gridiron, who were one of the original lodges that formed the Grand Lodge of England. Their lodge was failing and they hoped that Preston would help breathe new life into the lodge. He was voted in as a member of the lodge in absentia and two weeks later was made the master of the lodge. One of the members of the Lodge of Antiquity who convinced Preston to help restore the lodge was a colleague of Preston, John Noorthouck. As the lodge began to grow, Noorthouck for some reason turned on Preston and began to refer to members who had joined to hear Preston's more intellectual form of Freemasonry, as Preston's disciples. In December, 1777 Preston, along with other members of the lodge attended a church service across the street from where the lodge met. At the church service they wore their masonic regalia and continued to wear it when they returned across the street. Older members of the lodge, including the two members who convinced Preston to join the lodge, felt this was not appropriate and complained to the Grand Lodge that they had formed an illegal Masonic procession. When the Grand Lodge sought to punish the lodge it caused a rift in the lodge. Half of the lodge remained with the Grand Lodge of England (Moderns) and the half Preston was with, allied themselves with the Grand Lodge of All England at York. Under this new system, Preston was able to grant charters, and he claimed that he gave out several charters, only two were ever confirmed. In 1790, after an apology, Preston and the others rejoined the Lodge of Antiquity and the Grand Lodge of England (Moderns). Many feel that Preston's version of Masonic history is far fetched. He starts his history with Athelstan and works forward from there. Preston was also part of the movement which brought Freemasonry out of Taverns and into buildings dedicated to Freemasonry. Preston passed away on April 1st, 1818.